In 2009, Columbia Pictures fired Steven Soderbergh from the movie Moneyball (which would eventually become an Oscar-nominated drama from director Bennett Miller) over changes Soderbergh wanted to make to the script. Filmmaking was changing, Soderbergh lamented a few years afterward, and the biggest change was just how little directors seemed to matter. He’d later flirt with retiring from the business altogether. The film, written by Tarell Alvin McCraney (Moonlight) and streaming now on Netflix, takes place during an NBA lockout. Agent Ray Burke (André Holland) has just signed the year’s No. 1 draft pick, Erick Scott (Melvin Gregg), but it’s a hollow victory — Erick isn’t playing and, more importantly, isn’t getting paid. To make matters worse, the team owners (embodied by Twin Peaks’ Kyle MacLachlan) know that the athletes rely on that income, and are willing to wait them out. Soderbergh and McCraney home in on a system simultaneously built on and exploitative of its players. White TV executives and team owners aren’t gambling with the same stakes as the predominantly black athletes, whose careers are often short and without any kind of safety net. Ray’s friend and former coach Spence (Bill Duke), who instructs the next generation of young ballplayers, makes that explicit, noting that “they invented a game on top of a game” in order to maintain control of it. Corollaries to slavery are drawn more than once — to which, when made glibly, Spence gnashes his teeth and demands the recitation, “I love the Lord and all his black people.” Though the point may seem heavy-handed, the comparison is no less apt. 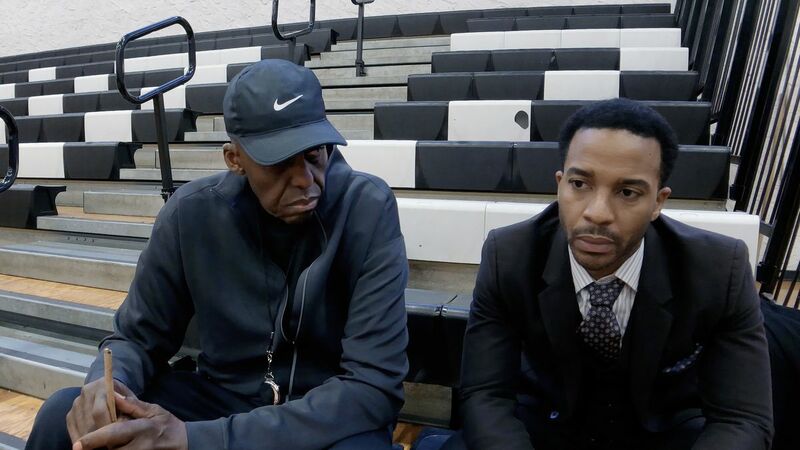 High Flying Bird has a lot on its mind, and the way a cameo by sociologist, civil rights activist, and author of The Revolt of the Black Athlete Harry Edwards is treated as a hero moment is proof enough of that. Fortunately, what could come off as pedantic and preachy is almost musical in McCraney’s hands, as delivered with seemingly effortless ease by Holland. There’s something heightened, near-theatrical, to Ray; Holland’s facility with McCraney’s dialogue has a specific rhythm to it, capped by reaction shots that make it clear Ray always knows when he’s being played. Clips of interviews with real basketball stars Reggie Johnson, Donovan Mitchell, and Karl-Anthony Towns, who detail their respective experiences going from rookies to the NBA, ground the drama even further. At points, Soderbergh’s voice is audible during those interstitials as he questions the athletes, but even within the “world” of the film, it’s hard not to register his touch. Like his previous film, Unsane, High Flying Bird was shot entirely on iPhone, and there’s a sterility to the images that, in combination with Soderbergh’s aptitude for staging scenes and creating a sense of intimacy with his cast by literally positioning the camera close to them, visually telegraphs the split between the love of the game and the game itself. Perhaps it’s more keenly felt because it’s a personal story. The racial politics at play in High Flying Bird obviously don’t apply to Soderbergh, but the story is still one about taking a DIY approach to disrupt a system that treats the people within it as expendable. The smaller matches Ray brews up in his attempt to wrest control from the owners may not have the same kind of backing, but he has autonomy — and Soderbergh himself has essentially spent much of the last few years trying to do the exact same thing. Just compare the budget of High Flying Bird ($2 million) to that of Moneyball ($50 million); he’s making films on his own terms now. This falls apart slightly when it comes to distributor. Netflix (and Hulu, briefly) is cited as a disruptor within the sphere of the film, as the control that the owners exercise over broadcast games and matches doesn’t extend to the world of streaming. But if High Flying Bird wants to lay claim to some measure of verity, there’s no universe now in which Netflix could be considered such an underdog. It also bears mentioning that there are layers to the way this film is specific to the contemporary landscape. The ubiquity of technology (anyone can shoot a movie with just an iPhone) is key to Ray’s strategy for getting back in the game — and it seems to be Soderbergh’s, too.